I’m confused as to why Tomoatoes, grapes, cucumber, watermelon are on the safe list? Aren’t most GE’d to be seedless etc? You are confusing hybrids with genetically engineered, which happens a lot because the GMO industry wants to confuse people so they aren’t concerned about the issue. Hybrid merely means two different but closely related varieties are cross-pollinated to create a new hybrid (say crossing a favorite large tomato with another tomato that is a lot more prolific, hoping the end result is a more prolific version of the favorite tomato). This also happens naturally in gardens when you have lots of variety of veggies planted, they cross-pollinate naturally in the wind or with insects, and then you save the seeds for them at the end of the growing season. 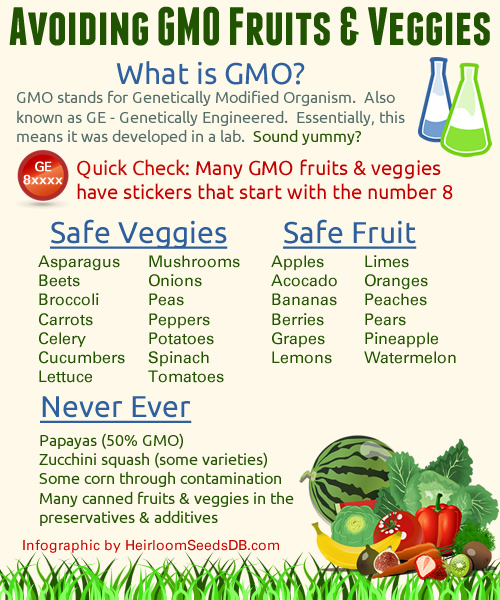 Genetically engineered veggies/fruits are created in a lab by changing the plant’s DNA using genetic engineering. Think of it as a sort of in-vitro fertilization among plants that would never be able to occur naturually. In more understandable terms, it would be similar to trying to cross a dog and a cat genetically through DNA in a high tech lab, something that could definitely not happen in nature. 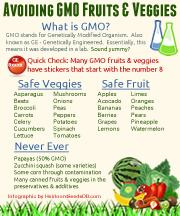 This is also why you often hear GMO / GE food called frankenfood.